In the User Portal, navigate to the Call History button. 1. Filters allow you to search for specific number and dates. 2. Navigation buttons allow you to go to page through call history. 3. Allows you to change the number of calls to display per page. 4. Allows you to export your call history to a csv file, which can be opened in programs such as Excel. 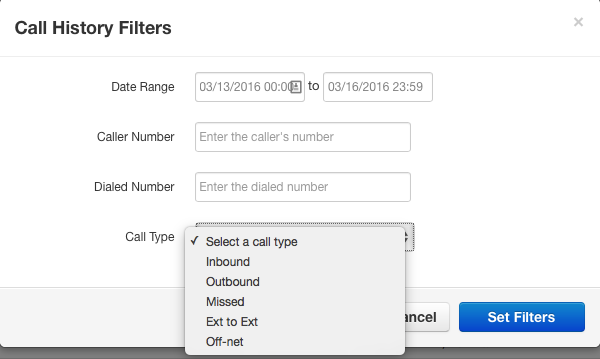 By clicking on the "Filters" button you can filter calls based on several separate characteristics. If you know the date of a specific call you may set the date(s) and time here. You may also search for the telephone number of the caller or the number that was dialed. If you know that you placed the call or it was an incoming call you may filter by those specific calls in the "Call Type" drop down window. Inbound: This displays all inbound calls, whether they were from an internal or external (off-net) caller. Outbound: This displays all outbound calls, whether they were to an internal or external caller. Missed: This displays all missed calls, whether they were from an internal or external caller. Ext to Ext: This displays all internal (extension to extension) calls, whether they were inbound or outbound. Off-net: This displays all external (off-network) calls, whether they were inbound or outbound.